You are currently browsing the Bookmobile News weblog archives for February, 2014.
Who wants to sample prize-winning truffles, handmade chocolates, moist brownies, and other offerings from Sonoma County chocolatiers? And then watch a hilarious movie afterward? You do, of course! 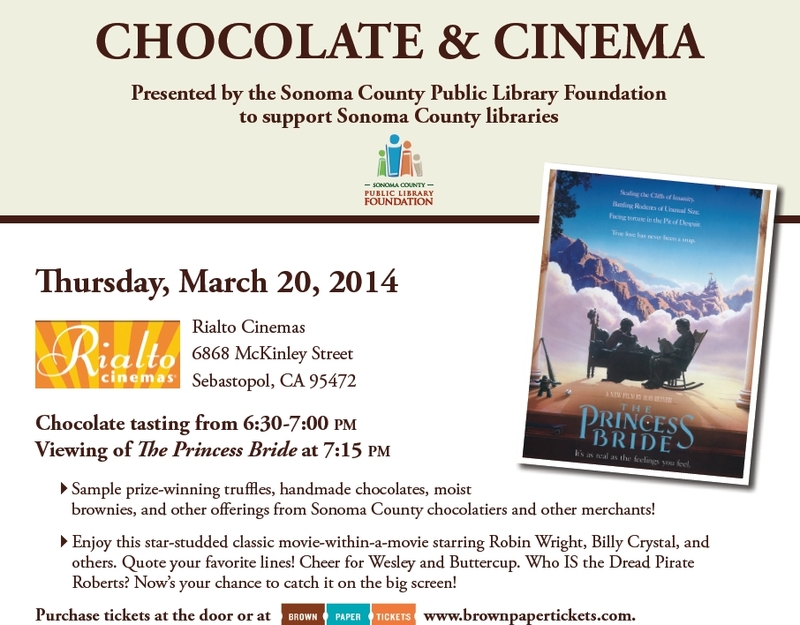 Please mark your calendar for this lovely fundraiser at the Sebastopol Rialto Cinemas to benefit the Sonoma County Public Library Foundation. This non-profit works hard to support all 13 of Sonoma County’s public libraries with a variety of programs and resources. Plus the Free Bookmobile will be there, so you know it’s gonna be awesome. Click here for tickets, just $35 for all-you-can-sample magnificence from the most talented chocolate & brownie wizards in the county…and The Princess Bride on the big screen!